Angles of the LCD monitor can be adjusted when shooting by holding this unit in a high or low positions. To move the LCD monitor, do not apply excessive force so as not to damage the connected part. 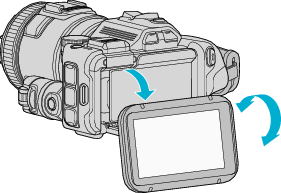 When this unit is not used or during transportation, set the LCD monitor to its original position.